A month into his new role as the University of Auckland’s first Pro Vice-Chancellor (Pacific), Associate Professor Toeolesulusulu Damon Salesa speaks to Newsroom about education, leadership and the need for New Zealand to recognise itself as a Pacific nation. According to Dr Salesa, his new role is a sign that the university recognises the importance of the Pacific to New Zealand. “This is the first time a university in New Zealand, and effectively the world, has appointed a Pacific pro vice-chancellor and it shows an understanding that the Pacific has to be at the centre of what we do as a university. The University of Auckland is the largest provider of university-level education to Pacific people in New Zealand. “So we take the job of producing the next generation of Pacific doctors and lawyers and engineers and teachers and performers and artists very, very seriously,” he says. As the university continues to build, Dr Salesa will be using his role to make sure the future of the Pacific is taken into account, on equal terms, when decisions are made. “And that includes making sure that we're building a university that is welcoming for Pacific students and their families, and building new knowledge that Pacific communities and countries can use to ensure their growth,” he says. He sees this support of Pacific neighbours as a real advantage with opportunities to help with research in the region and foster positive relationships with regional universities like the National University of Samoa and the University of South Pacific. 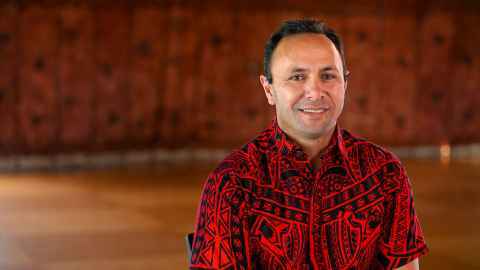 Dr Salesa is confident he will see a future with more Pacific academics. “The question is how quickly and the answer is not quick enough. But one of things I'll be doing immediately is formalising a plan that ensures we are nurturing and supporting our Pacific staff. Video used with permission from Newsroom Damon Salesa: Pākehā are Pacific Island people too published on 4 December 2018.